Homemade granola is a staple in our house. It hits the spot sprinkled on top of cereal in the morning and is my favourite afternoon snack (mixed with yogurt and a bit of maple sugar). Chances are, some of your homemade favourites would make welcomed gifts for your friends and family. 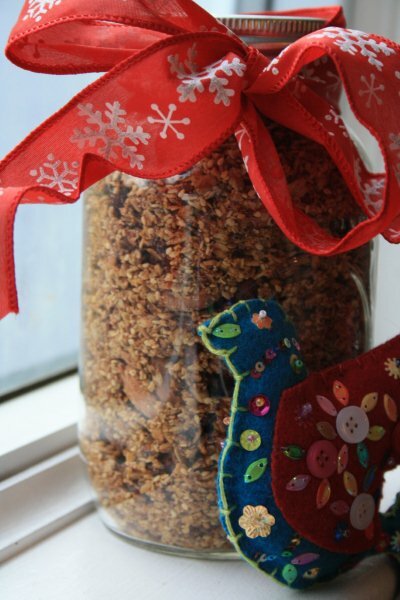 They're the sort of practical gifts that are extra special because you took the time to make them and because they generally taste a lot better than the store bought version. he recipe below makes enough for you and a friend. The best ingredients make the best granola. I use Speerville oatmeal, and sunflower, sesame and flax seeds in this recipe. Look for Speerville Flour Mill products in the natural foods section of the grocery store and at some markets throughout the Maritimes. Look for Terra Beata dried cranberries (from Nova Scotia) at Petes Frootique in the City Market and at other local markets in Atlantic Canada. Stir liquid into dry and mix until well combined. Spread on a sided cookie sheet that has been lined with parchment paper. (You can use two 9"x13" pans). Bake in a slow oven (300 degrees) for 45 min to an hour, stirring every 15 minutes so the edges don’t get too brown. When it's almost done turn off the oven and leave the granola in until it cools. Cool completely, add 1 cup of dried fruit if you like, and put in an airtight container. If you’d like it to be sweeter just add a bit more syrup or honey. Walnuts, orange juice and dried cranberries stirred in at the end.